Update or customize Apple watch face everyone likes to do daily because that’s more impressive in style and Feel. 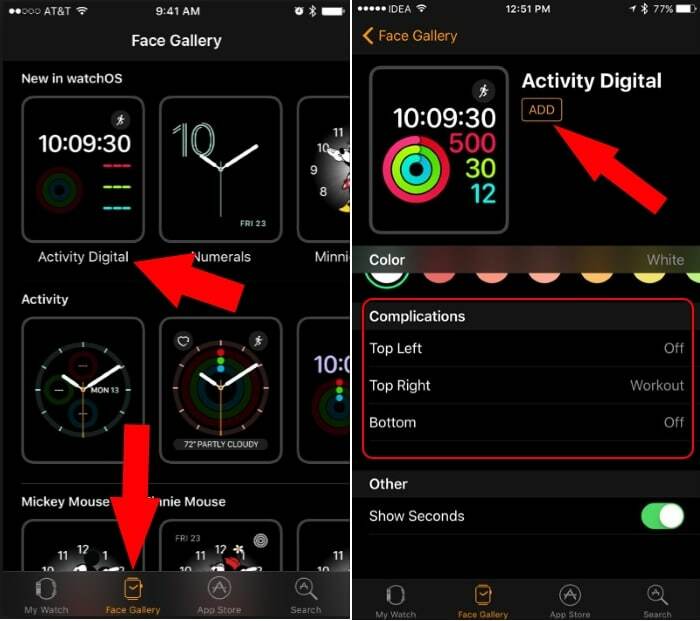 We have different Apple watch face customization options like add a new one, Edit existing Face or Delete Apple watch faces in watchOS running on Apple watch Series 4 or apple watch 3 and earlier Apple Watch. 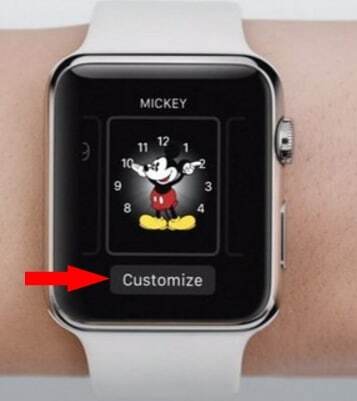 This time Apple has changed the way of apple watch face customization. Remotely we can manage it (Delete apple watch faces in watchOS) by iPhone my watch app. Redesigned Watch App added more features and Functionality. So we can do remotely on the big screen more appropriately. Instant preview, Re-Order and Delete face options. Add new Faces from Pre-installed Gallery called Face Gallery. For add new Face, Face Gallery tab available at beneath. Also customization option also there, Like Colors, Left/ Right widget Alignment, and Bottom widget. To edit any of the faces, Force touch on Face screen. Next, you will get customize option that can change only with the Digital Crown. Otherwise add new face you can add, Sliding left to end of the face. Tap on “+” icon to add your custom widget. 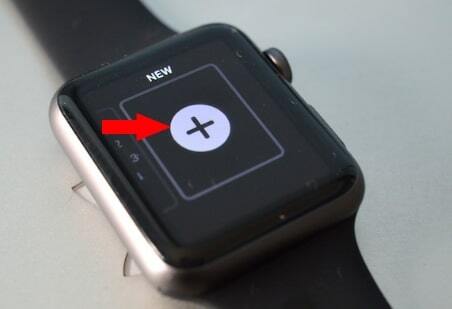 2: Next, Tap on My Watch tab. 3: Under My Face Tab, Tap on Edit from the top right corner. 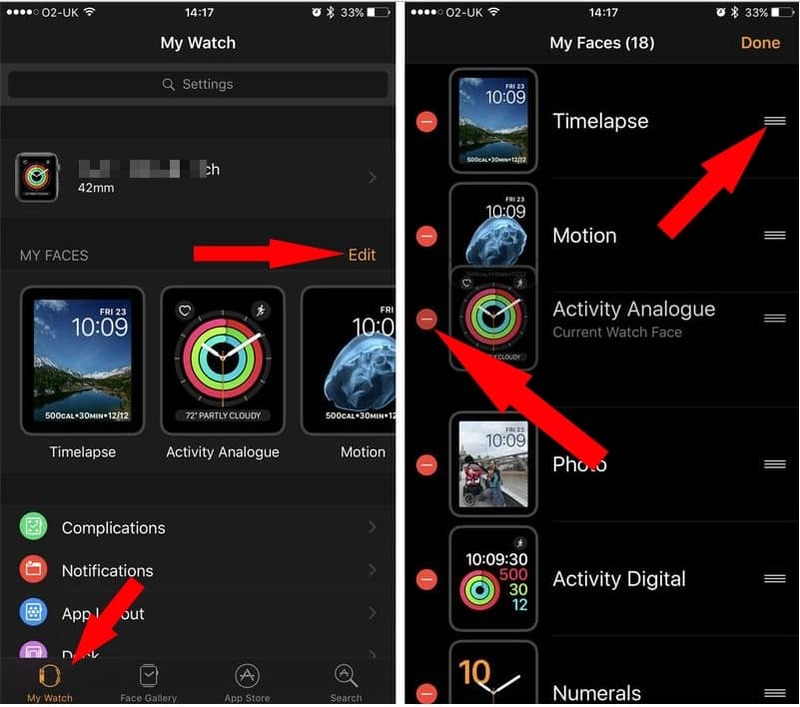 4: Now you have a two option, Delete or Re-Order watch faces from the sequence. To Delete: Tap on red circle icon near to each face for delete. 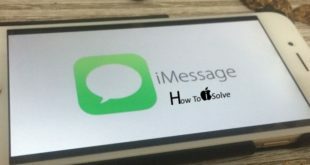 Re-Order: Tap on Three horizontal line and move the finger at top or bottom. Different Face is useful for your primary activity and importance. Like Activity, watch Dialog, Digital Clock and more. Create your new one or customize existing without any limits also delete Apple watch Faces in watchOS that are unused.